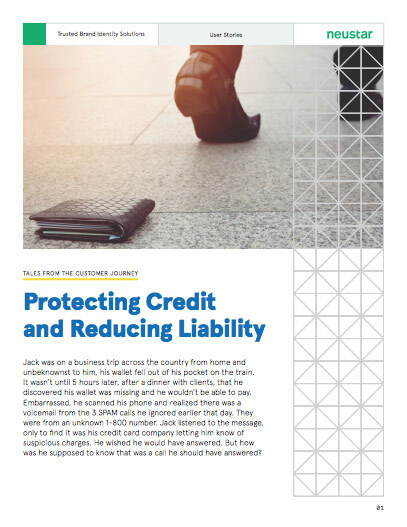 Jack was on a business trip across the country from home and unbeknownst to him, his wallet fell out of his pocket on the train. It wasn’t until 5 hours later, after a dinner with clients, that he discovered his wallet was missing and he wouldn’t be able to pay. Embarrassed, he scanned his phone and realized there was a voicemail from the 3 SPAM calls he ignored earlier that day. They were from an unknown 1-800 number. Jack listened to the message, only to find it was his credit card company letting him know of suspicious charges. He wished he would have answered. But how was he supposed to know that was a call he should have answered? With so many alerts about phone scams, including those about people posing as customer representatives from financial services companies, customers are leery to answer unexpected and unidentified calls. When customers see a call come in with a warning that it may be SPAM, they will heed the caution and not pick up. They don’t want to become one of the statistics of fraud – especially when all the warning signs appear that they should be suspicious about a call. And how does the credit card company know their legitimate calls are being marked as SPAM and that’s why their customers aren’t picking up? Usually for consumers, no news is good news when it comes to being contacted by their bank or credit card company. But when there is an important and urgent issue, such as suspicious payments on a credit card, financial institutions need to talk to their customers as soon as possible. They need to verify the transaction with the customer quickly to avoid the inconvenience of cancelling and reissuing a credit card when it may not be warranted. Customers feel safe knowing their financial institution is protecting them from fraud and appreciate proactive customer service. And for the business, it reduces liability as a creditor since the compromised card can be closed as soon as your customer consents.